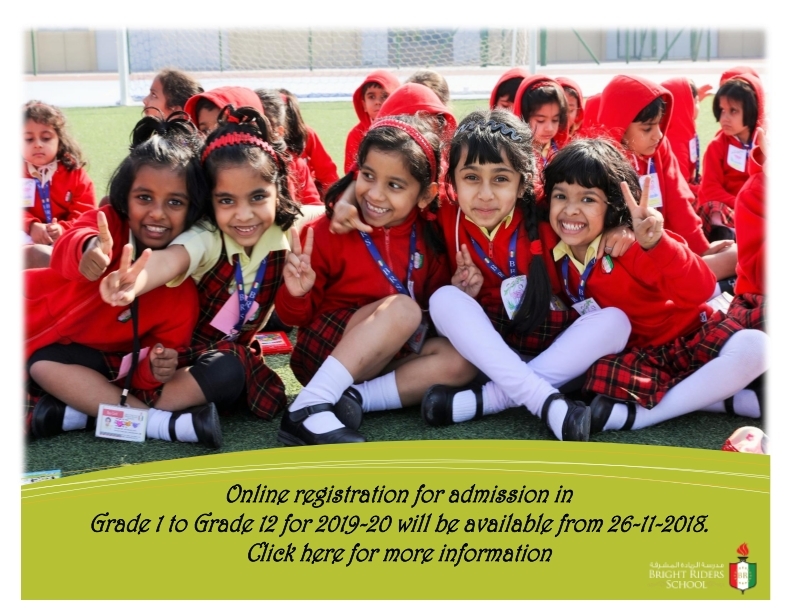 Admissions open for the academic year 2019-2020 in Bright Riders School, Dubai. For details contact 04 8237444. All applicants should be wearing a badge mentioning his/her full name, reference number (stated in the confirmation mail) and grade for which he/she has applied for. A printed copy of the confirmation mail(received during registering online) should also be carried along. Students will be assembled in the school auditorium and later will be taken to the respective classrooms. Students are expected to bring their own stationery (pen, pencil, eraser, ruler, geometry set, etc.) for the test. Students shall be permitted to leave the classroom only after 10.30 A.M. after completion of the test. No mobile phones / electronic gadgets are permitted inside the room. Parents are requested to be present at the auditorium at 10.30 am to pick up their wards. (Students will be brought to the auditorium after the completion of the test). Parents who wish to wait at school can be seated in the auditorium after 8.30 am until the pickup time. Once the child is dropped at the auditorium, the school holds no responsibility of looking after them. The entrance exam results for Grades 3 to 10 & 12 will be declared on 17-01-2018 and for Grade 11 declaration date will on 23/01/2018. The results will be strictly based on the performance of the entrance test and subject to availability of seats. Results will be mailed to the respective registered email id mentioned in the online registration form. Parents of successful candidates will be informed as and when vacancies arise, based on the merit order. Kindly do not call the school enquiring for the results. Those students who cannot make it for the entrance test on 13/01/2018 can approach us only in the month of March. On the availability of seats during that time entrance test will be conducted.